The Model SSPU York Sweeper mounts on your skid steer loader or tractor loader using the universal skid steer loader quick attach standard. The unit has its own integrated dirt/debris container that is part of the unit and attaches the sweeper to the loader arms just like your bucket does. 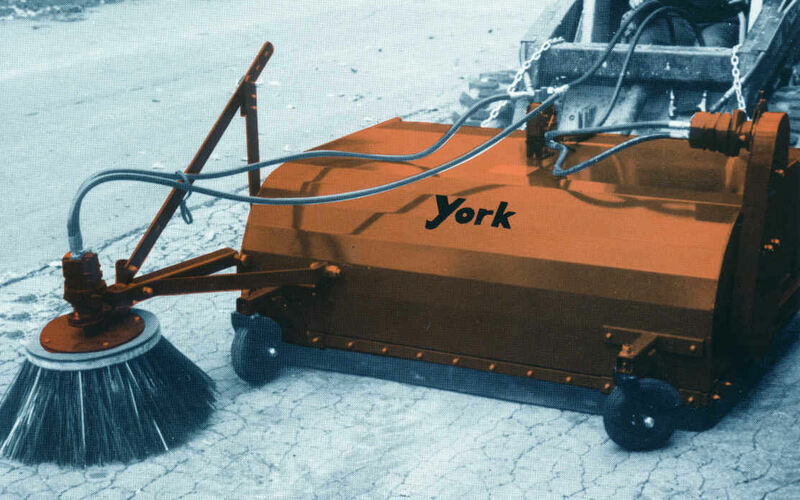 The model SSPU is hydraulically powered, and has an optional gutter brush available. The model SSPU is available either 5 ft. or 6 ft. wide. An optional flow control is also available to control the speed of the gutter brush for loaders that have hydraulic flows exceeding 25 gpm, this is a needed accessory if the hydraulic flow is above 25 gpm, otherwise gutter brush will spin too fast. Note: Units are crated, 5 ft. crate weighs 200 lbs., 6 ft. crate weights 225 lbs.